Online search engines like Google drive most of the traffic to websites. Being visible at the top of the search results is the best way to get noticed online and attract more visitors and customers. The vast majority of clicks to a website happen on the first page of the search results, so getting there should be your main goal. The two main ways to get your site to the top of the search results are search engine marketing (SEM) and search engine optimization (SEO). These tactics may sound similar but they are actually quite different. 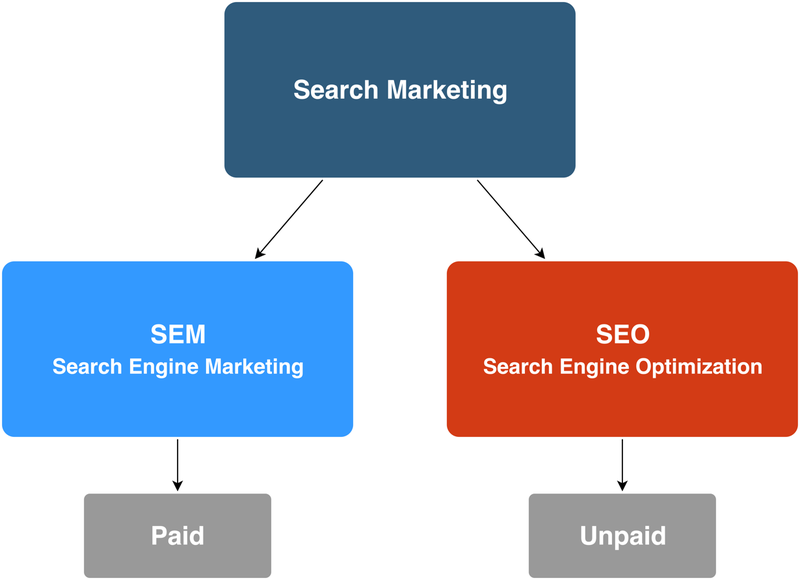 Search engine marketing (SEM) involves buying traffic using paid ads while search engine optimization (SEO) involves earning traffic using unpaid methods. The term search marketing is now widely used as an umbrella term for both SEM and SEO. These terms are defined differently in some places, but the above terminology has become fairly widespread. Bottom line: Search marketing is widely used as an umbrella term for SEO (unpaid) and SEM (paid) tactics to gain visibility in search results. Search engine marketing (SEM) involves the strategy and process of setting up ads to gain visibility in SERPs (search engine results pages). When talking about SEM, people often refer to PPC (pay-per-click) or simply paid search. The largest platform by far is Google Ads, formerly Google AdWords. The Google search engine is responsible for around 90% of all internet searches, followed by Bing, Yahoo and Baidu. To gain visibility in search results by buying ads, Google Ads should be your top priority, unless all your customers happen to be huge Bing fans (which is rare). Paid listings or ads appear in the search results based on the keywords the marketer has targeted for those ads. Listed ads are marked with a green “Ad” icon in Google’s results as you can see in the example below. 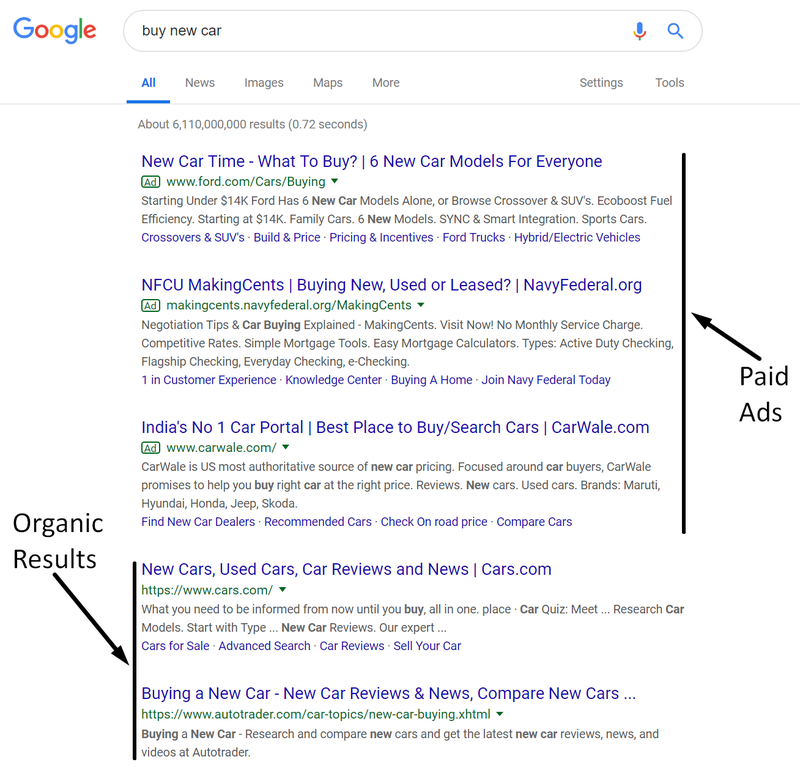 Take a look at this Google search results page for “buy new car.” Paid ads often occupy the majority of the screen real estate if the keywords are in high demand. Ads include a headline, a display URL and a description to highlight the product or service details. Google also allows advertisers to provide more information about their product or business by adding ad extensions. These include information like phone numbers and business location. Keywords are the foundation of SEM. When you set up an SEM campaign, you should conduct thorough research of the keywords your potential customers use to search online. There are both paid and free tools available to find keywords relevant to your business. These include Google Keyword Planner, Keywords Everywhere and SEMRush. These tools allow you to research keywords, compare costs and even analyze competitors. Finding the right keywords requires careful planning and monitoring of results to see which ones work the best for you. It is important to be clear about what you are offering and why customers should select your product or service over others. It is good to include specific details like pricing and shipping terms and your ad should always be relevant and consistent with the landing page it directs to. The last step of setting up an SEM campaign is to choose your budget and bid. In Google Ads, you set a daily budget for each of your campaigns. This will determine the overall cost for all ads and keywords belonging to that campaign. Google uses a bidding system to determine which ads are displayed. You can either let Google automatically manage the bids or you can do the bidding manually and bid higher on certain keywords. For example, if you think your ROI (return on investment) is greater for certain keywords, you can bid higher on those. The ad auction is not as simple as “the highest bid wins”. In a very Google-like way, you are rewarded if your ad or keywords are more relevant. So, even if you have a lower bid, you can still rank higher if your ad is of a higher quality. Last but not least, you will need to set up your target geography, language and audiences. There is a vast number of ways you can set up your target audiences. For example, you can target people with specific interests, buying behavior or use retargeting tactics to serve the ads to previous website visitors or customers. Bottom line: With SEM, businesses conduct keyword research and create paid search marketing campaigns. These campaigns target keywords that consumers in their industry or product category use to search online. Search Engine Optimization (SEO) is the other part of search marketing. SEO involves optimizing your content and website to make it rank higher in the organic search results. Although you don’t pay for your ads to show directly, you need to invest a lot of time and effort to produce high-quality content that deserves to rank high. A good SEO strategy involves producing high-quality content that contains good answers to people’s search queries. The content should contain the keywords that people search for in the title and text. If your page has great content that fulfills the intent behind the keywords, your page will rank higher. SEO also involves optimizing the technical aspects of your web page like speed, reliability, indexing, mobile-friendliness and security. A good user experience (UX) is paramount and your site needs to be fast and easy to use on all devices. Backlinks from other websites are also an important part of SEO. In fact, PageRank, the Google algorithm that ranks pages based on links, was the first ranking algorithm used by the company. Quality is more important than quantity when it comes to backlinks. Links from related and trustworthy sites carry much more value than low-quality links from random sites, which Google may even ignore completely. Bottom line: SEO involves publishing high-quality content that efficiently answers the search intent behind keywords and keyword phrases. High-quality content on high-quality websites tends to rank well with SEO. The goal of both SEM and SEO is to make a web page appear higher in the search results. But the methods are completely different. SEM is fast and you can start to see results in a matter of minutes by using paid ads. As soon as you start your campaign, ads will start appearing in searches with your keywords. On the other hand, SEO takes time (often months or even years) and will definitely test your patience. SEM costs money and you pay for each click on your ads. Ads are only active as long as you keep paying for them and sometimes you will have to pay more and more to get consistent results. On the other hand, SEO is mostly free. You don’t pay for clicks and, contrary to SEM, the results of SEO improve over time. Although paid and unpaid listings look similar, people tend to favor organic listings when deciding what to click. People click organic links up to 18 times as much as paid ads. But the good news for SEM is that click-through rate (CTR) for paid ads has been steadily increasing in the past few years. Bottom line: SEM can provide near instant results but at a cost, while SEO takes a long time to implement but gets more effective over time. 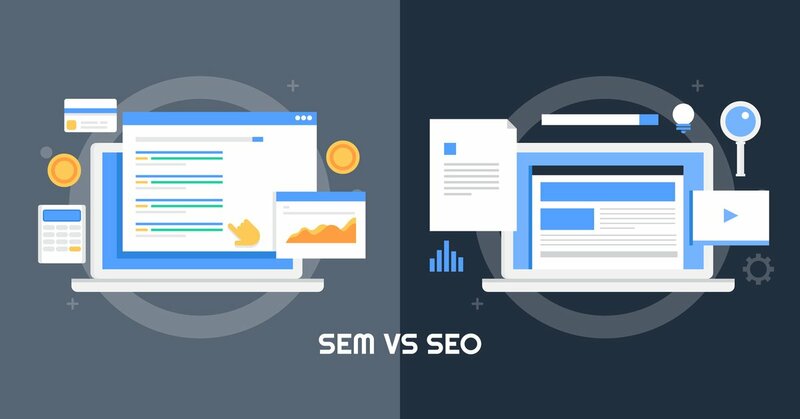 Knowing the differences and similarities between SEO and SEM will help you decide which is better for you and your business. In many cases, a combination of both strategies will be best in the long term.